What is a Visual Item? What are Visual Items? Visual Items are icons (shapes) that can be configured as icon/data placeholders. 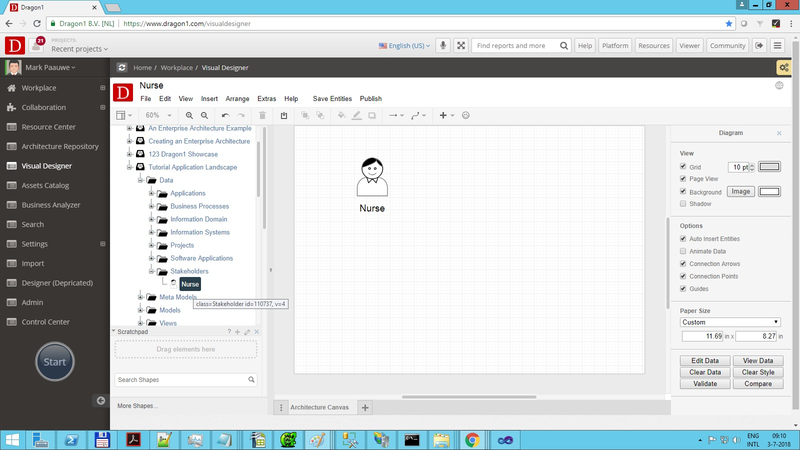 Visual Items can be used to generate data in a specific layout on the canvas, using icons. Although there is a specific icon for a visual item, the sun shape, any icon can be used / treated as visual item. If you use any other icon than the specific visual item, Dragon1 will use the shape of the icon by default for generation data. Depending on data and rules you can change colors, names and positions of icons with a visual item. Suppose you want to know which application has no service level contract, then you configure a visual items to color applications without service level contract data red and have it shown a call out. Below you see an example of a stakeholder entity linked to a visual item. If the stakeholder entity in the repository changes of name, the visual item will automatically change its name. You can add up to three rules in a visual item. Once you have placed data in a folder, or created a model or a view (a filter on a model), you can link a Visual Item to that folder, model or view and place the Visual Item on a visualization canvas, telling the Visual Item which shapes, sizes and colors it should use to draw the data from the folder or view on the visualization. Before using a Visual Item you need to have data in a folder and a model and/or view in place. Click Edit. The New/Edit Dialog is shown. Now you see the Visual Item being interpreted by Dragon1. It now acts as a piece of the puzzle, like a mini visualization. Now you see the visualization interpreting all the visual items attached to it. The rules that you need to configure for the visual items are the same as for the views. You will now see the visualization showing configured bitmaps for shapes. If no bitmap is configured, the basic shape used in the model is shown. You can present the list be in a row or column, circle, triangle, rectangle, square or block.